This warm, secluded and enchanting country home with breath taking views from every window will make you think you’ve just stepped into a Currier and Ives painting. There are many near by activities to enjoy; you can water sking, boating or fish right from the dock. A twenty minute drive will take you to the historic town of Brunswick. The post-modern, shingle-style, 4100 square-foot house is located on Sebascodegan Island in Casco Bay on the coast of Maine.The property is situated on a totally private, secluded peninsula within the Cundy's Point Association on five plus acres, with 2000 feet of shoreline. The house is within 50 feet of the water on all three sides. There is a private dock(tidal) which will accomodate a boat of up to 40'and a mooring is provided. To the West are open views of Quahog and Casco bays, Big Hen, Birch Island, and Yarmouth Island. To the East is Ridley Cove and the picturesque fishing village of Cundys Harbor. The International Jet Port is just 50 minutes away. The sunrises and sunsets from this location are magnificent. There are several paths from the house through the extensive natural landscaping, perennial beds and cutting, vegetable, and herb gardens, which add charm and color all year long. The gardens extend to the sea banks; they are professionally kept and contain peonies, old-fashioned beach roses, lilacs, Asiatic lilies, dahlias, blueberries, wildflowers, lupines, rhododendrons, bayberry, hydrangeas and foxglove. The Living Room faces the water with direct access to the wrap-around deck through three sets of French doors and a staircase to the back gardens and deepwater channel. The Living Room also has a woodburning fireplace! Directly behind the Family Room is a large screened porch for waterfront dining and boat watching. Upstairs there are three large bedrooms and two guest baths. There is one one king sized bed, two queens beds, two queen pull out beds and two twin beds. One of the bedrooms has an adjoining sitting room, which can be used as a fifth bedroom. The property also has a dock for tieing up your boat or swimming. Rick Wohlfarth is a specialist in residential real estate . Rick established Wohlfarth & Associates, his own Upper West Side brokerage (NYC) firm in 1978, as a developer and general contractor creating moderate and low-income housing in fringe areas of NYC. Rick is a CPA who has worked for ten years with both a public accounting firm and a Fortune 500 company. As an investor in New York City buildings for co-op conversion and condominium development, Rick lives on the Upper West Side and thus has the advantage of knowing intimately the townhouses, co-ops and condominiums all over NYC. As principal of Wohlfarth and Associates, Rick emphasizes the following factors as instrumental to the firm’s success and solid reputation: personal interest and service, thorough knowledge of the market, good negotiating skills, honesty, and accountability. Rick is licensed in New York, Connecticut & Maine and has sold and leased over $1 billion worth of properties, ranging from luxury co-ops and condos, to lofts and townhouses. Fluent in Portuguese. . Over the years, Rick has assumed a leadership position within the industry, formerly as Chair of the West Side Committee of the Real Estate Board of New York (REBNY), whose mission is to promote and uphold the highest professional standards of practice. Rick has also been a member of REBNY’s Deal of the Year and Public Relations Committees. Rick was the 2012 President of MANAR (Manhattan Association of Realtors) and sits on the council Board of Directors of FIABCI (The International Real Estate Federation - New York City Council). In addition, Rick is a member of the American Institute of Certified Public Accountants and the New York State Society of CPA’s. He is a frequent lecturer at numerous institutions including New York University, the City University of New York, and REBNY. and personal decisions, and his warm, no-nonsense straightforward manner reassures his clients. I bought this property a number of years ago because I was surrounded by water on all three sides and the complete privacy of being on a peninsula. I live and work in NYC in an apartment building so this offers a completely different escape for me. 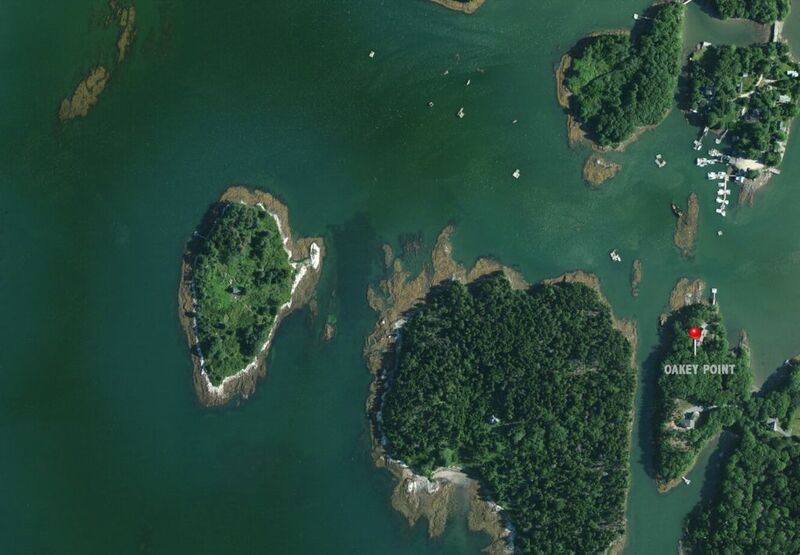 Most of the islands nearby the house are deeded back to the Harpswell Land Trust so they will never be developed and will remain untouched. We have a American Bald Eagle sanctuary in the island (Big Hen Island) directly in back of the house and they visit us in the trees frequently. Water water everywhere, watching the boats go by , really being in nature. This is not just a typical rental house. It's my 2nd home. It has been professionally furnished with antiques, and original Maine art. I want people to enjoy it just the way I do when I am there. This elegant and beautifully decorated home surpasses all expectations of a vacation cottage and provided ample space and privacy for a two-family reunion, eight adults altogether. A highlight of the stay was a visit by bald eagles from a nearby sanctuary. Rick is a gracious host who is quick to respond to questions and offer suggestions for dining and activities. Truly a one-of-a-kind escape to sophisticated peace and quiet. Three generations enjoyed this very comfortable, well appointed, well built, beautiful home on a quiet wooded peninsula of Cundy's Harbor. The row boat and the kayak offered a unique opportunity to get out on the water and to explore the area. The large kitchen and dining room allowed wonderful family dinners and game nights. (Oh, and the kids and working adults appreciated great WiFi!). It was very obvious that a great effort was made to cover every detail to make out stay comfortable. We greatly enjoyed our stay and would highly recommend. Well what a pleasure was to stay in your beautiful home Rick. My family is all around the Casco Bay Area so to be able to find such an amazing home with a dock for our boat was such a blast. We island hopped daily. Most of our extended family choose to lounge at Rick's home because is was so comfortable. Swimming, boating, paddle boarding, fishing we did it all. The weather was perfect and I have no words to describe the sunsets. The house is furnished beautifully. The linens were high end to say the least. We loved our time in Harpswell and would recommend this house highly. Thank you for the 5 star treatment Rick! Our family spent a week at this gorgeous home and loved every minute. The house is beautiful and comfortable with water views on all sides. Private and remote in feel but only a 5 minute walk to one of the best lobster shacks around. Adirondack chairs on the point for reading. Lovely patio to watch the sunsets. Dock for swimming, kayaking and canoeing. The owner Rick answered every question within minutes. He also gave us some great local tips. I didn't want to leave! All the way, from responsive interaction, to wood for the fire, to a beautiful, crisp, clean, and eclectically decorated home. An excellent way for us to spend graduation week with family. We stayed a week at this lovely house on a beautiful plot of land. Highlights were: kayaking and canoeing around the point, watching the Perseid meteor shower from the dock, enjoying sunset from the Adirondack chairs, and exploring the Brunswick area. The kitchen is fully equipped and the caretaker, Dan, was extremely helpful. I would think twice about bringing small children – there are a lot of breakables around, but aside from that we recommend it highly. Please note: During the winter season, the price listed is for 2 people; an additional $50.00 will be charged per guest. Monthly and seasonal rentals available, contact owner. Check in time is 4 pm on saturday and Check out time is 10 am saturday. Cleaning fee $400.00 A $1000 security deposit is required. In addition to the weekly rates, please add a 9% Maine sales tax. Chef and additional help available, contact owner.